Kevin brings over 20 years of experience working in sales, management, and consulting for import, distribution, and restaurant groups throughout the United States. Prior to co-founding Rapp Wine, Kevin most recently worked for Republic National Distributing Company. A 6th generation Washingtonian, Kevin has deep rooted connections throughout the DMV area and a growing national and global network of partners in wine & spirits. He is Co-Founder of Bike to the Beach (B2B), a 501(c)3 non-profit foundation that raises funds and awareness of autism through 100 mile charity bicycle rides. Since it's inception in 2007, B2B has grown from a single event in Washington, DC, with 23 riders raising $23,000; to a nationwide organization that has raised well over $5 Million. Nicole has spent the past 10 years as a strategy and business management consultant. Previously, she worked for BNY Mellon as a Senior Information Risk Officer and Program Manager, managing a $250M+ program with $1.7T in assets. In addition, she was a branded business management consultant for Booz Allen Hamilton for over 7 years, providing program solutions for top U.S. financial institutions on business solutions. Nicole has worked in international relations and has led several international cooperative development programs on behalf of the U.S. government, working with EU and NATO, specifically with France and Italy, under joint development agreements. Kylie began her marketing career working in financial services at BNY Mellon where she led marketing strategy and budgeting for the DC and Virginia markets. She also led event strategy and execution. Kylie then moved to an education technology firm to work with their brand team. She now helps Rapp Wine share their story. Kylie is in charge of all things marketing: brand management, digital, social, web and content creation. Derek grew up in the wine and spirits industry working at his family's small liquor store in Boulder, Colorado, where he helped to curate the wine selection. After a year spent studying at the University of Rome and subsequently graduating from the University of Colorado with a degree in Italian Language and Culture, Derek's path with Italian language, culture, and food was well on its way. After graduation, Derek lived for a time in Florence, Italy, and Herrenberg, Germany, where he began his first explorations into the wines of Tuscany and Alsace. Derek then returned to the U.S. where he settled permanently in Maryland. 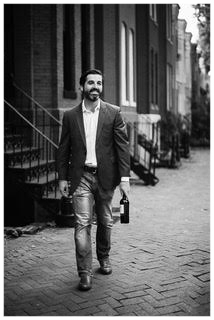 He has since successfully completed an intensive Italian Wine study and sommelier training program through the Associazione Italiana di Sommelier and a variety of courses through the Capital Wine School in DC. He is currently working on his certification as a Master of French Wine.